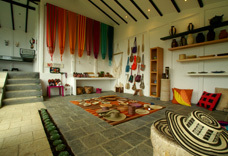 Dantica Cloud Forest Lodge has a beautiful gallery, 3 large rooms full of indigenous art, art and handicrafts. Products you probably will not find anywhere else in Costa Rica! One reason is that our products come from all over Latin-America; Argentina, Bolivia, Brazil, Colombia, Costa Rica, Ecuador, Guatemala, Panamá, Perú and Venezuela. In this way we show you the diversity of cultures on this continent united in one single space. From necklaces to furniture, ceramics to hammocks, wooden benches to bags we offer you a large variety of products at a high level both in design and quality, elaborated with pre-Colombian techniques or contemporary craftsmanship. Many products we show are still in use in a number of indigenous and rural communities in Latin America. Furthermore a variety of products we sell is designed by us, giving you also the guarantee you will find them nowhere else. This is the place to take something home to remember your Cost Rica journey, to get some nice, different and original gifts for family and friends, or even to decorate your house! We have sevaral galleries; one in Lincoln Plaza, Moravia, San José, and two more at the Pacific coast: in Plaza Herradura, Playa Herradura and in Jacó Walk, Jacó. Opening hours are from 10.00 AM to 20.00 PM, 7 days a week.